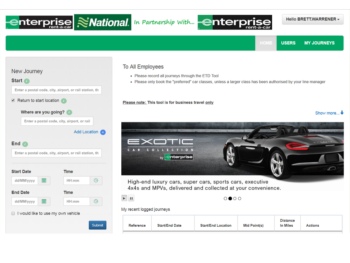 Enterprise has launched a free journey-planning and booking system, which shows the relative cost and environmental impact of grey fleet, daily rental and car club vehicles for business travel. Enterprise Travel Direct compares different travel options for employees. Enterprise Travel Direct shows live availability of local vehicles in real time, tailored to company policy, and asks employees to confirm whether their own car is suitable for business use. Journeys are logged before they take place, for more accurate expenses claims, and it also records travel patterns with the aim of identifying better solutions for businesses based on how their employees move around. Enterprise said the system was was piloted over 12 months with some of the UK’s largest public sector fleets, and was shown to cut journeys and business mileage, as well as changing employee behaviour.